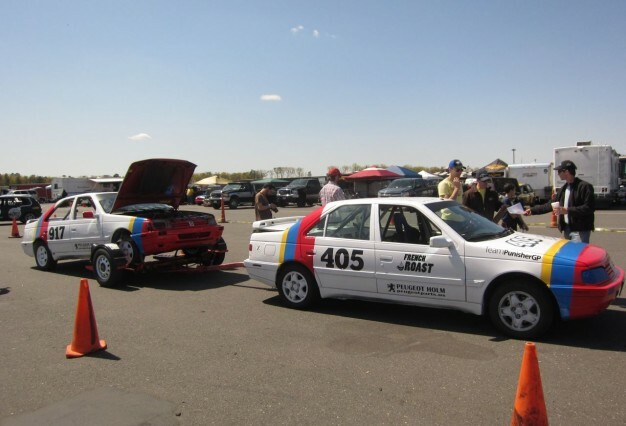 This post is a bit delayed but Team PunisherGP had a glorious weekend at the Real Hoopties of New Jersey – 24 hours of Lemons race on April 14-15th. French Toast and the new car French Roast gave their all to deliver 30 hours of truly punishing driving. It will certainly go down as the classiest bunch of guys and French machinery that have ever been assembled. The team took home the Judge’s choice to top off a perfectly scripted weekend. The weekend kicked off with an eventful BS inspection. 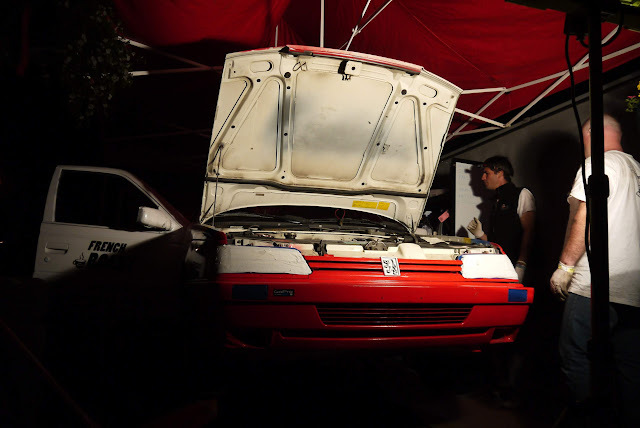 The recap of which was covered on the Car and Driver blog. “First time we’ve seen one LeMons car serving as tow vehicle for its sister car.” We were compelled to showcase the ‘so euro’ fact of having a hitch on an economy car. As expected from a breakfast based organization we threw down some tasty vittles. 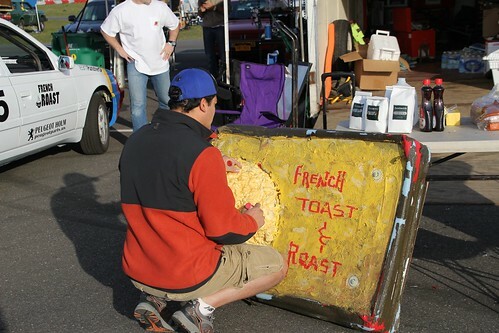 There was endless French Roast and French Toast to get the racers going both mornings. 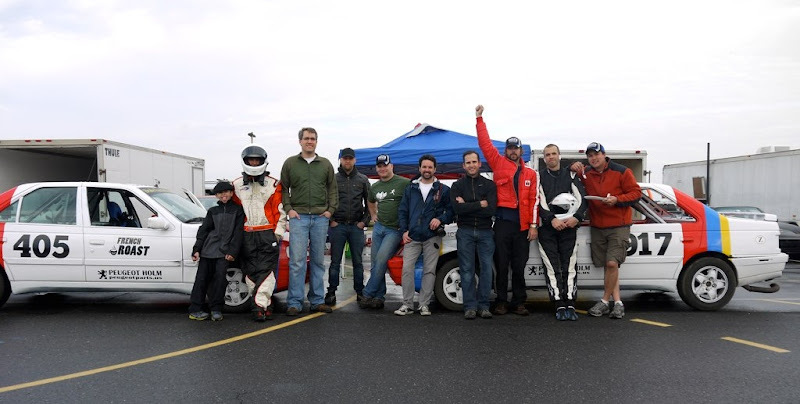 The real fun began with Paul and Mark leading off the driving in the Toaster and Roaster among a field of 102 cars. Sheer madness. In car video of all drives can be found on youtube. What followed was stint after stint of white knuckled lunacy all weekend. We mostly stayed on the track all Saturday but the Toaster got mixed up with the Red Bull Suzuki and another hit and run left us passenger mirror-less on the Roaster. There were reports that the X-90 driver took a cruel and unusual penalty of getting a full spray on Jersey tan from which they have received permanent melatonin damage. We were mechanical free with one hour to go on Day 1 when Wade was spotted coasting into the pits having misplaced the clutch. Fortunately there was one on hand, albeit from a non-Mi16 405 of smaller diameter and dubious compatibility. Mark and Wade got cracking while the rest of us cracked open some adult beverages. The car was buttoned up and we were able to turn in early. Nightmares of Stafford swirled in our heads that night as other unfortunate teams remained at the track in various states of disrepair. Our hearts and some of our tools went out to them. 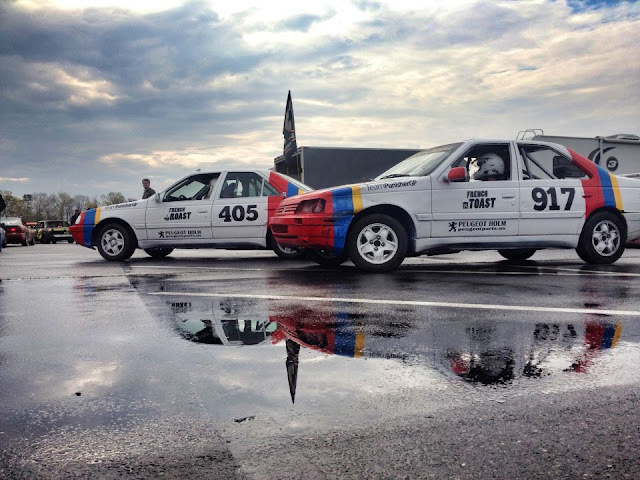 We woke to a moist track on Sunday prepared for some general side-swipery from our competitors. There was no foul play however as we raced hard and occasionally found ourselves in the penalty box. Napper was served the most appropriate penalty possible. He was required to weave an entertaining yet factual tale (by Spencer Tandy standards) about why certain prosthetics are immune to STDs. The synthetic maple syrup to the rear wheels and exhaust system made for sticky handling which kept us on the track and out of trouble the rest of the day. Napper and Wade finally raced all the way to the checkered flag and came across the line in proper Lemans side by side fashion. While we won the French manufacturers title placing 40th and 52nd we were at times disappointed to find all manner of vehicular and ocean going vessels passing us throughout the weekend. There was consensus among the team to find some turbos for the next race. Wade is determined to search the Parisian Quartier Pigalle district and other dirty establishments to assemble the necessary parts to make sure we don’t lose our honor in future endeavors. That didn’t sour our mood however as we partied as if French endurance racing is going out of style. Brian, our celebrity photographer/driver, threw down some Instangramicious photos for his 100,000 followers. A full flickr album of his shots from the weekend can also be found here. The less professional team album can be found here. 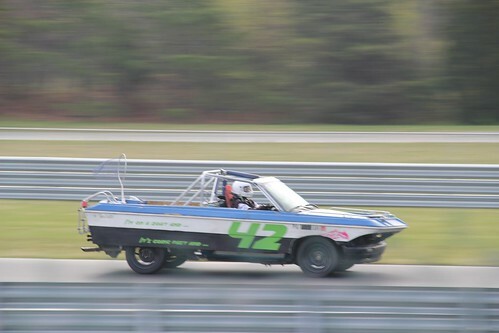 Team PunisherGP will be at New Hampshire Motor Speedway in Loudon, NH May 5th and 6th 2012 . Come see our Peugeots duke it out again with German and American muscle cars. Look for our new Peugeot Sport flagpole. Eat, drink, be merry and come by to say hello for tomorrow we drive!